One of the fond memories of my childhood is having dinner with my family sitting on the outdoor table called “pyoungsang”, a large square low table that stands in the middle of courtyard of the house for people to sit on. It is unique to Korean culture that is easily found in the countryside. Everyday we had our dinner sitting on this Pyoungsang during the summer season. 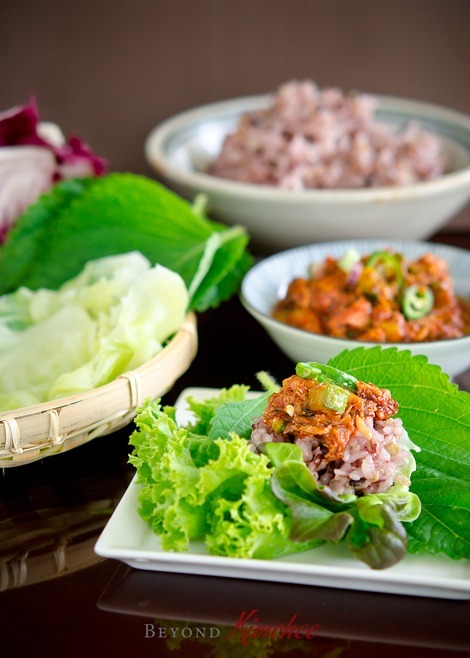 My mother often prepared this delicious Ssambap (rice wrap with assorted lettuce and leaves) and made the fish topping sauce that goes with it. The blazing summer sun have finally settled down in the evening with a cool breeze and the night stars were popping out here and there in the sky, the moments and the foods of those summer days that we had together as a family still remains dearly in my heart. Ssambap is a country style Korean food. 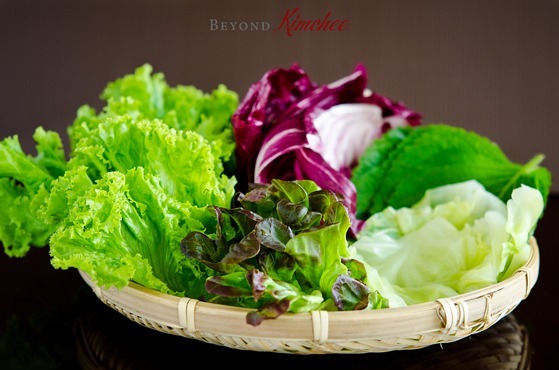 Just picked from the farm, freshest lettuces and the leaves of all kinds are always available in the country. Many city people go to the Ssambap restaurant to comfort their nostalgic country mouse childhood memories. Ssambap is very easy to put together. Get a varieties of leafy lettuces, cabbages, perilla leaves, pumpkin leaves, thin sea kelps. Most of them can be eaten fresh and some (cabbage and pumpkin leaves) are steamed. Serve your Ssambap with multi-grain rice rather than white rice. It just taste better and healthier. 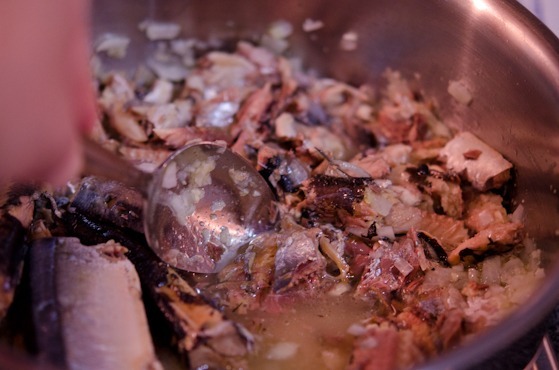 There are many different types of topping sauce you can serve with; meat, fish, tofu, mushroom, or just plain. 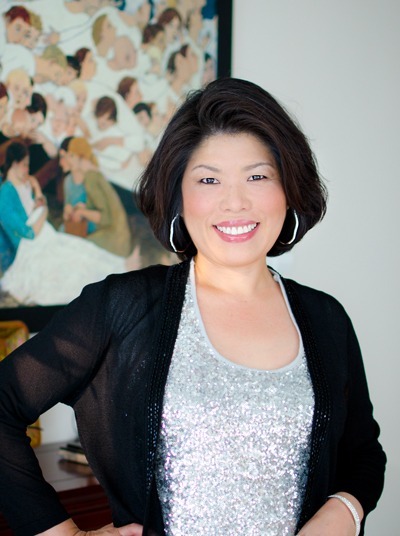 Today I will show you one of my favorite topping that is very easy and inexpensive to make. The taste? You better try yourself to believe. 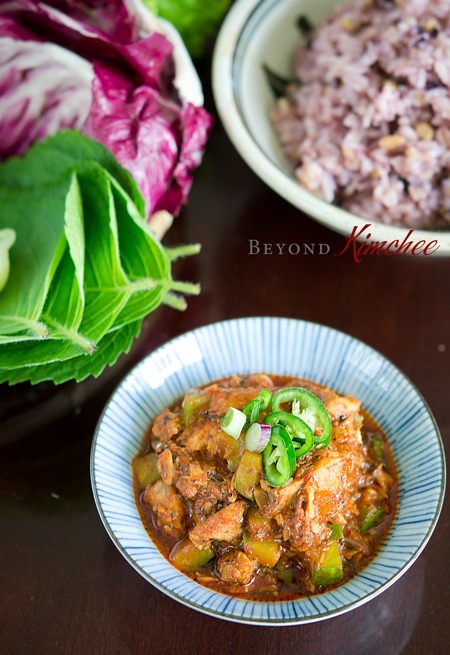 If you like the rustic Korean flavored dishes like doenjang stew and fish, you will love this. I guarantee. Get any assorted lettuce and variety of edible leaves you like. I added Perilla leaves and cabbage leaves. 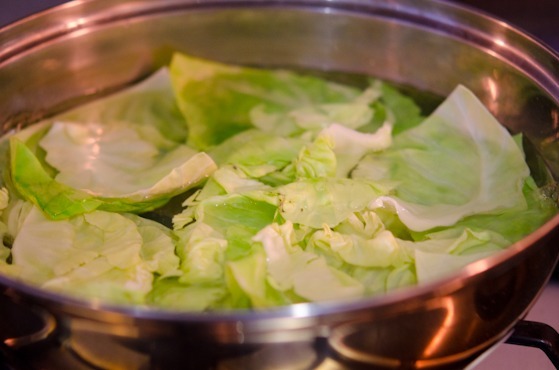 Boil cabbage leaves for 4 minutes and drain. Chill with lettuces. 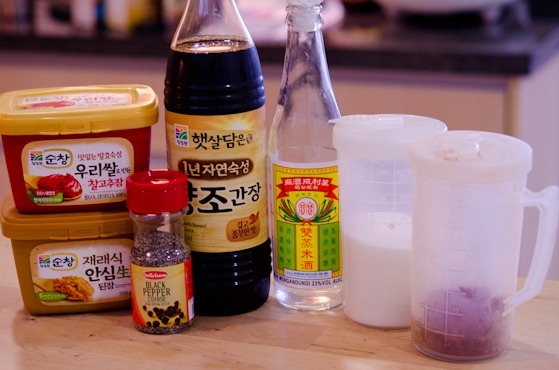 Let’s make the delicious fish topping sauce (Ssamgjang, 쌈장) to go with our wraps. ‘Hello, I’m Mackerel Pike. Nice to meet you!‘. He is a cousin of Mr. Mackerel, a blue-backed fish. But Pikes carries a little smaller gene in the family. You can use canned mackerel or tuna if you can’t find him. Drain but reserve 3 tablespoon of the can liquid and set aside. Here are the seasoning team who came all the way from the country of morning calm. 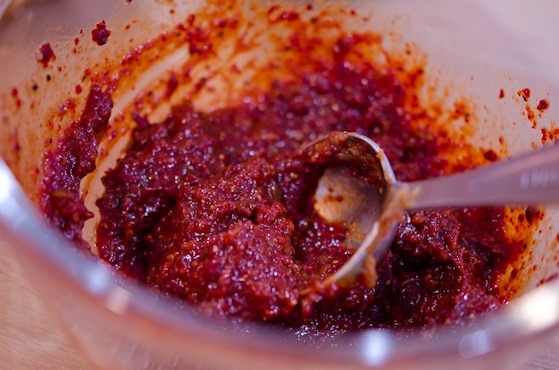 Korean chili paste, soybean paste, black pepper, soy sauce, rice wine, sugar, and Korean chili flakes. Mix all together with given amount. 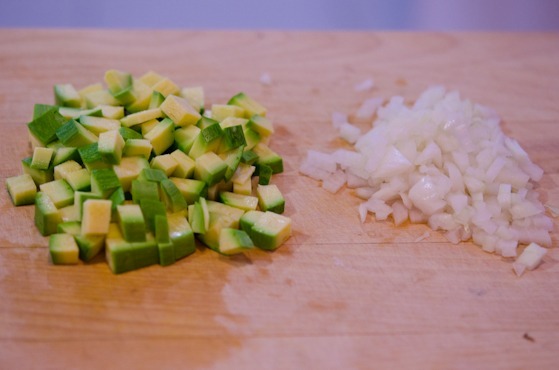 Chop a small piece of zucchini and onion. You might want to chop some garlic as well since you are holding a knife. In a small pot, add a little oil and saute onion and garlic for 1 minute. Dump the Pike family and the reserved juice. Don’t bother to de-bone them. They are perfekly soft and add 100% natural calcium to your body. 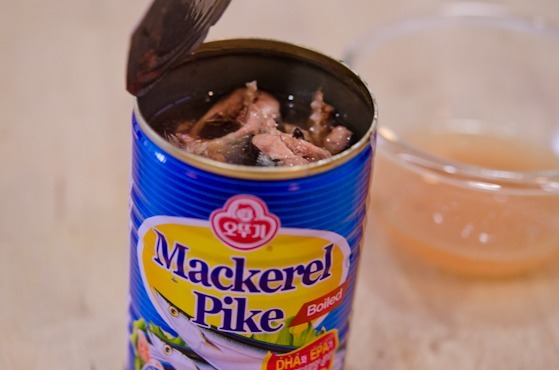 Using a spoon, break off the pikes into small bite size chunks. Add 1/2 cup water and bring them to boil. And the zucchini pieces. 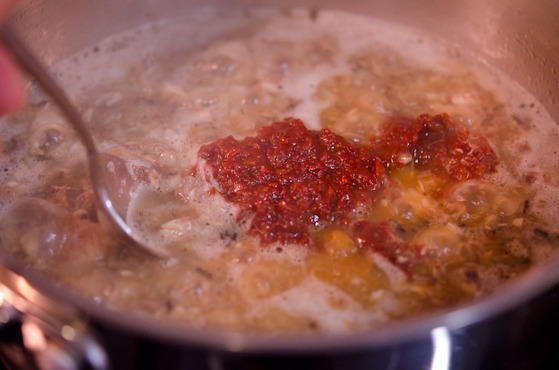 Continue to simmer over medium-low heat for 7-8 minutes until the sauce gets thicken. At last add green onion and green chili (optional) to add the extra spicy kick. Simmer for 1-2 minutes. The sauce will thicken more as it rests. That’s it! This sauce it just so good to mix with rice as is. Here is an image of how to put together! 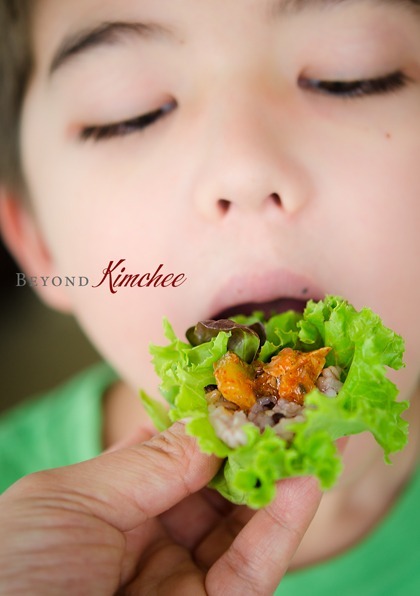 Place your rice (Mulit-Grain Rice) on any lettuce or leaves, put some topping sauce on top, gather-up, and just SHOVE it into your mouth. No biting-off, please! This is NOT a time to have the European table manner that you would do at a Michelin starred restaurant. This is a country Korean food. Time to be a country mouse without the nibbling. …I don’t like seeing people nibbling the food I made. I hope you experience the same joy I had today. Combine all the seasoning ingredients in a small mixing bowl, set aside. 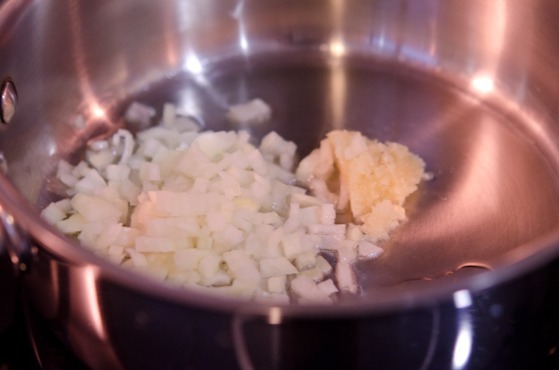 In a small sauce pan, saute onion and garlic in oil over medium heat until soft. Add the fish, reserved juice, and the water and bring to boil. Add the sauce to the pan and stir. 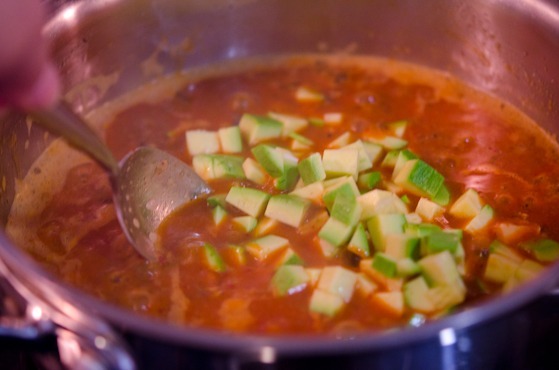 Add the zucchini and bring to boil again. 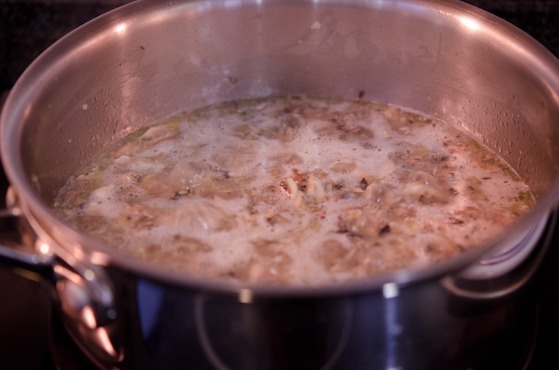 Reduce the heat to med-low and simmer for 7-8 minutes or until the mixture thickens a little. 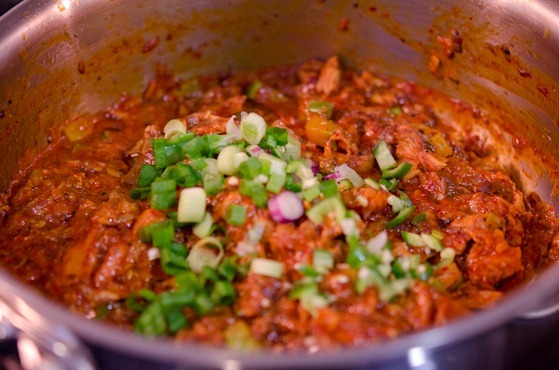 Add the chili and green onion, if using, and let it cook for another 1-2 minutes. Remove from heat and let it cool. It will thicken more as it cools. 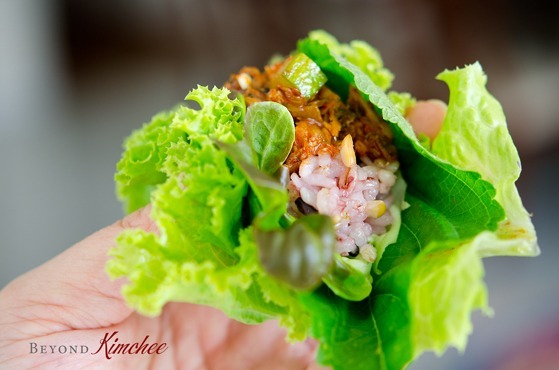 To serve the dish, place 1 tablespoonful of rice in the middle of lettuce, top with the fish topping sauce, about 1/2 Tbsp, and gently bunch the lettuce together and eat in ONE bite! Love the picture of your child eating! Really, really nice. As is this recipe - incredible flavors. I think nostalgia in food is universal, it's just that different cultures have different foods that evoke that emotion. Really interesting and fun post - thanks. Another gorgeous post, and one bookmarked to try. I'm a fan of anything designed to be eaten with fingers, and gusto! This looks totally delicious - thanks so much for sharing. I love eating with my fingers, too. This is great, how beautiful that bite looks...love it going into your child's mouth! :) It would make me smile too! The dish of lettuce is so pretty! Thanks for this great recipe...I have some multi grains and rice just waiting for this! Thanks Lyndsey. Make some rice with multi grains and try with any lettuce you have. It is tasty and so good for you. Ssambap is my ultimate Korean favourite!!! Love this post! I've heard of this dish but have never really tried it. I can't wait to try it. Thanks for the recipe!! Also is there anything else I can use instead of the fish? Any suggestions? If you want similar flavor, canned tuna will work. If you prefer non-fish, try with tofu or mushroom. Great idea! I think I will try tofu! Thanks! This is my kinda food. Will have to have it this week me thinks, thanks. You are welcome to join in my monthly food blogger event THE SOUP KITCHEN, here for entry details and current theme offering a new theme each month. All bloggers are welcome, hope to see you participate soon. It's so hot today and no wind... 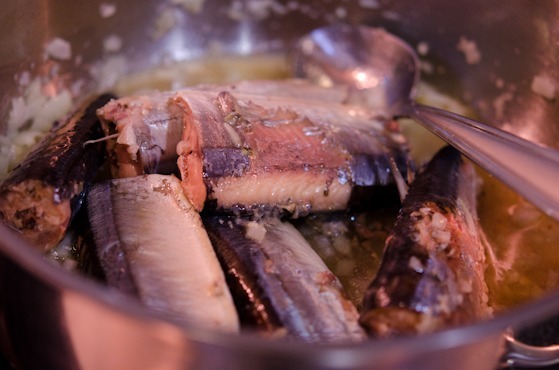 I wish I have seen your post earlier and made this fish sauce with canned tuna or canned mackerel (I don't think mackerel pike exists here in any form... I remember reading about it on Japanese blogs and I think I have never seen it). Using lettuce as wraps is so refreshing, healthy and light! 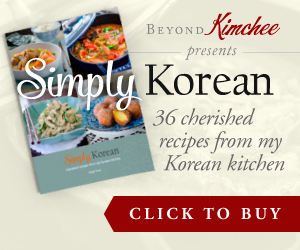 I will soon start experimenting with this excellent Korean way. It also makes a particularly beautiful dish. Thank you Sisi. This is perfect summer dish and healthy. Hope you get to give it a try. I loooove your pictures. Everything you cook and photograph is DELICIOUS! We love fish, all kinds. Mackerel sounds wonderful especially wrap like this! Now I'm so hungry looking at your photos (at wrong time!). Yum. I LOVE Ssambap! I once had a super memorable Ssambap meal in Gyeongju, with a million different leaf types and fillings. Thanks for this recipe, I look forward to trying it! Thanks Allison. So, you've been to Gyoungju. That is great. It's been such a long time since I have been there. I am glad that you tried this dish before. Drool.... That first image will be stuck in my head as soon as the temperatures begin to rise. So refreshing (and a snap to eat)! I have just returned from a 2 week trip to Korea and had just that kind of dish served to me in Busan. Instead of lettuce, the wrapping was more like one of the other leaves in the pictures you posted. My host called them pumpkin leaves. Does that sound right? I have never seen this kind of pumpkin leaves in the states. I have a small garden and would love to be able to grow this at home. Do you happen to know the name of the species? Thanks Holly for sharing this delicious recipe truly speaking this refreshed my childhood memories. I will be making this the next hot day! (we're in Southern California now, so summer lingers long into fall....) I will substitute either potato or tofu or mushrooms for the fish. Potatoes are so good in sauce like this as they just soak up the flavor! Thank you for the recipe. This is the second time I've made this dish. I love it!!! I've also made the Bean Paste Stew. Thank you so much for providing these excellent recipes. The flavors take me back to when I was 4 years old and living in Korea with my mom. My nanny had me eating dishes very similar.